In Downtown Miami, the festivities begin on Saturday March 16 at 12 noon with the 4th Annual St. Patrick's Day Fest. 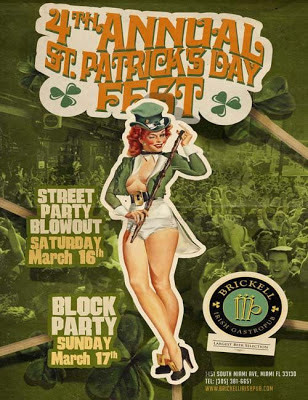 Hosted by Brickell Irish Pub and Segafreda Brickell,this not-to-be-missed street party will have live music, food specials and tons of green beer. A massive stage will showcase Stray Jacket, The Culture, Robert Elias, Liza Quinn. And the celebration continues on Sunday, March 17 with a Block Party. Fado Irish Pub anchors the party at 900 S. Miami Avenue. Festivities begin as early as 8 a.m. with a “Kegs & Eggs” breakfast. 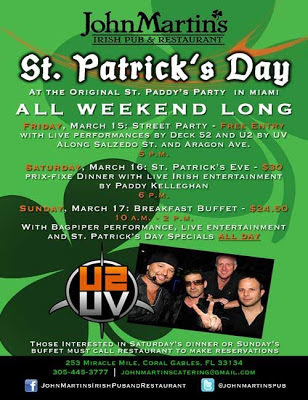 The fun continues throughout the day both inside the pub and on the streets with live music and entertainment, including bagpipers, Irish dancers, and a U2 tribute band. There is a $20 cover charge for the indoor party, but the outside fest is free. Celebrate St. Patrick's Day at the original Street Party now in its 22nd year at John Martin's Irish Pub & Restaurant this Friday, March 15 at 5 p.m. along Salzedo St. and Aragon Avenue in Coral Gables. 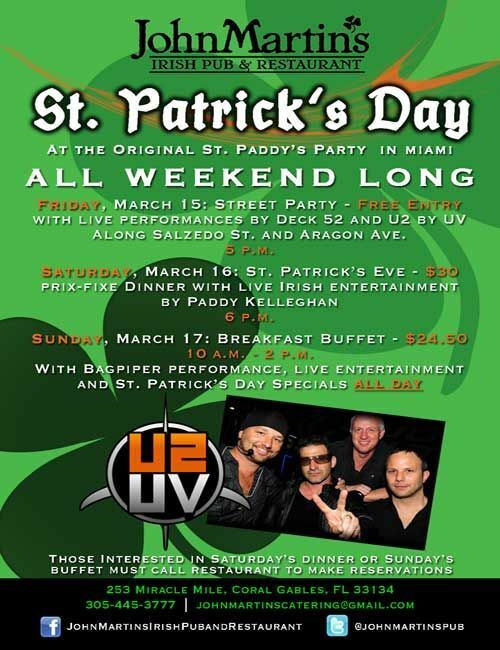 Street party will feature music by Deck 52 and U2 by UV, food, drinks and more. The event is free and open to the public! Festivities continue with a prix-fixe dinner on Saturday and to culminate the weekend of celebrations, Sunday will feature a breakfast buffet with a bagpiper performance and live entertainment all day.